Ready, just in case | Live Healthy S.C. The emergence of new public health threats, such as Ebola and other illnesses, emphasizes the importance of proper training for DHEC’s staff. That’s why on March 26, 2015, DHEC’s Pee Dee epidemiological staff underwent training in the use of Powered Air Purifying Respirators — commonly known as PAPRs (pronounced “pappers”). 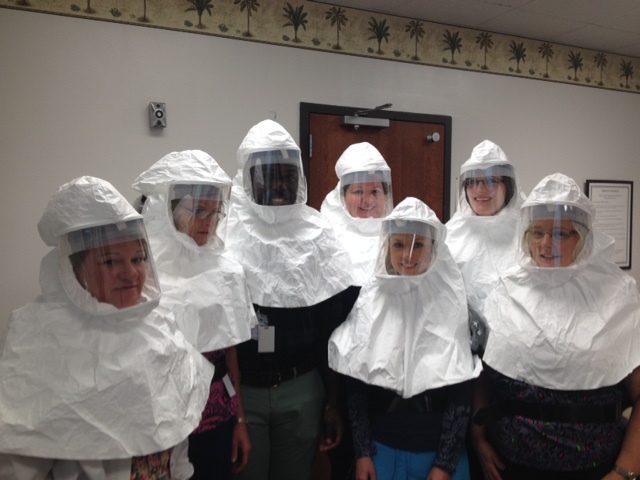 PAPRs include hoods and face shields to provide protection to health care workers from exposure to potential infectious airborne germs and viruses. These disease-causing agents are often transmitted when a sick person coughs, sneezes, vomits or undergoes a medical procedure. PAPRs, which are a type of personal protective equipment, provide an effective barrier to stop the spread of illness so the workers can provide care to a sick person. Each member of the team was trained in the proper way to use the equipment, including how to put on, or “don,” and remove, or “doff,” the PAPRs, as well as replacement of filters and battery packs, and how to clean the equipment if it becomes contaminated. It’s important to note that there are no cases of Ebola in South Carolina. But knowing that DHEC staff is training and preparing for this and other infectious diseases should be a comfort to all citizens of the state. Congratulations and thanks for being prepared, Pee Dee epi staff! This entry was posted in Emergency Preparedness and tagged Ebola, PAPRs, Powered Air Purifying Respirators, public health threats on April 7, 2015 by SC DHEC.